I never understood Paul's words about being a foreigner more than I do now. Only I'm a foreigner in Christendom, not in the world. The journey was easier in Sydney. Less pressure. Less Christians. Less criticism. Less big eyed looks. And no Denomination to wrestle with. Maybe this is catching up on me because I'm back home? Please don't get me wrong. My situation is not unique. Like driftwood, I am loosely connected to thousands of others like myself who have gone before me and will follow behind. Nor do I feel "better than" or more right. More like a "not fitting in." I'm still excited about the process. Some might call it a meltdown. In truth, this is probably what it is. But it feels more like an awakening. In the end, I long for the days to come of reconstructing something that is real and honest for me. Something that makes sense in light of history, scripture and culture. Eventually, I too, will come to a place of temporary rest. This is my peace. And I know it aches, when your heart it breaks. You can only take so much. what if you are a log? Ha! Good thing it's not 'driftlog.' Driftwood sounds so much tougher and more eloquent. driftwood always makes great decorative pieces... widdled away and put on display. 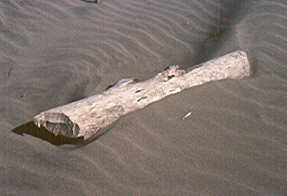 what makes the driftwood "drift"wood? is it that it has left what is was? is it that it has stopped drifting, but had drifted? is it that it is still drifting? good imagery - the tired, worn down, smoothed out image of driftwood can definately be a metaphor for the journey of life, meaning and God. where does the drifting lead and does it have a destination? good thoughts josh - i just thought i'd think outloud on your comments. Greetings my friend from Australia!! I hope this fiends both you and Karie well. Josh it seems to me that you may be constructing a reality that has no answers. You seem to be trying to understand God and make sense of something that you your self said in a message we (as humans) will never understand. What is it that you are seeking from God – Understanding? Truth? Reality? I have read some of the past Blogs and it seems (maybe just to me) you are checker-boarding people in your own community and comparing there checker boards to your own. May you think their checkerboards don’t match up to yours and in some way you are striving to construct a better checker board than anyone else. I was thinking only today that one of the paths to God is just to know he is there and to let him be God. You don’t need to complicate God but trying to make sense of him, whatever you come to realise or however you come to reconstruct God - or your meaning of him, at the end of the day he is still going to be God and we may all be surprised. As with Dave Owens infamous teaching you don’t have to follow the rules. This may not be the correct way to think about things ……but do I need to read the bible, read books and strive to learn all that I can about God in order to know him better or am I content in the knowledge that I do not really know anything about him except that he is there and in some fashion he loves me. Keep it simple Josh that’s the ethos you bought to Australia. God is God no more no less, He loves you, he loves me. I hear the pain you are going through Josh and I feel for you. Feel like a trip back down under? One last note that I had been thinking about while you were here but did not get a chance to discuss with you. First of all we need to realise there is always going to be a ‘flavour of the day’ so to speak and that flavour is always going to change regardless of what we as individuals do or say. This is reality. It seemed to me at the time you were in Aust that you are taking our present day understanding of God, with all of the personal relationship rhetoric and trying to apply that back down through history and in the end thinking it cannot be like this now because it was never like that then. How can a personal relationship with God be so important if those in the middle ages could never read and therefore never know God in the same way we do today. Maybe you should turn that argument around. There is nothing wrong with how our understanding of God changes or evolves throughout time or history. Understanding of concept has always developed throughout history and will continue to develop. The way we as humans understand the world we live in has been built on theories then experimentation and discoveries in the past. Maybe through science one day we will fully understand nature and the universe but that will only come about through the evolution of thought and discovery. I hope this is making sense it is a bit difficult sometimes to express meaning in monologue on paper. It seems to me ( and I maybe the only one) that the bible is also written on this principal. How does our (‘our’ meaning Humans) understanding of God evolve from the old testament to the new one. God needed Jesus to clarify and evolve some of the concepts and ideas humans had about God which radically transformed the church. Does this mean Moses was wrong in how he worshipped and acknowledged God – No. Did Jesus change the rules – maybe or maybe he just clarified them a bit for us dimwits. How did Paul relate to the changes bought about by Christ? He didn’t say I’m not sure if all you people have it right it doesn’t make sense back in the Old Testament. Paul instead continued to evolve and clarify the idea s and concepts Jesus out forward. Maybe that all people are doing today. I love you man and wish you well on your Journey…..
Glad to know I'm not alone. In my quest for truth I wonder if I'm further from it or closer to it than I was 12 months ago... I guess the fruits of the spirit are the determining factor. I would like to assume i am becoming more loving, accepting, gracious, forgiving, & tolerant, but in thinking these things, am i now struggling with pride??? Am I becoming the right kind of person? More loving, kind, and accepting? Am I in tune with ultimate reality? Am I being a force of good in the world around me? "I spent a long time trying to come to grips with my doubts, when suddenly I realized I had better come to grips with what I believe. I have since moved from the agony of questions that I cannot answer, to the reality of answers that I cannot escape." Your focus predominately seems to be on the very questions that men and women of faith have wrestled with and considered over the span of centuries, and without any clearer understanding. I believe those questions will always remain. That doesn't mean that we refrain from continually seeking God and growing in knowledge of Him However, that intense focus on seemingly unanswerable questions, can serve to cloud or distract each of us from the very answers that are right before us waiting to be grasped. Thanks for your interest. Yancey talks in similar fashion - question your doubts as much as you question what you believe. My only response is that I have less questions after 3 years and more answers. And it's because of these answers that I feel like driftwood among my Evangelical neighbors and friends. My journey started more with answers than it did with "questions that I needed answered." Keep drifting. The mistake comes in stopping. Then rotting. To many questions to much noise. It is important to ask questions indeed it is encouraged not only in Christendom but also in the world. ( are the two seperate?) discussion for another day perhaps. Just as it is important to ask it is also important to be still and listen to/for the answers. Hello -> Josh <- I just wanted to let you know that this post was an interesting read and well presented. Just my two cents.